Vehicles parked on any of the Warner Pacific University campuses or at any of the class locations must be registered with Campus Safety and display a current Warner Pacific University parking permit. Traditional undergraduate students on the Mt. 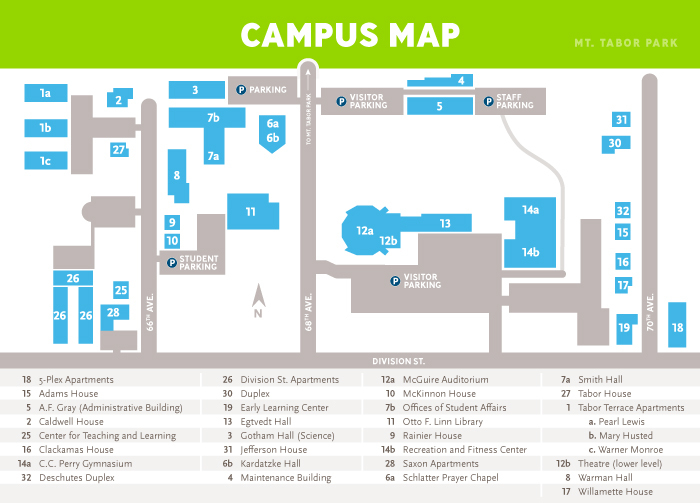 Tabor campus may purchase parking permits through Student Affairs for $65 per semester. When purchased for the Fall semester, your student account will be automatically charged for the spring semester. Professional and Graduate Studies students receive permits when they register for classes. Warner Pacific University is not responsible for the theft of or damage to vehicles while parked on any campus, class location, or University event. In an effort to be good neighbors to those around us, Warner Pacific employees and students are to refrain from parking on the public street in front of the houses not owned by the University at 2325, 2315, and 2245 SE 66th Ave. Warner Pacific vehicles parked in front of these addresses will be subject to ticketing per a permit on file with the City of Portland’s Department of Transportation. Access to the Library Bike Shelter for students or employees may be requested through Campus Safety. Please email Dean Ober, Interim Lead Campus Safety Officer, at dober@warnerpacific.edu. The request should include the bike owner’s name, student/employee ID number, and a description of the bicycle (make, model, color, style, serial number if known). While we do not require all bicycles on campus to be registered, we do encourage bicycle owners to at least keep a record of the above registration information in the event that they need to report that information to the Portland Police Bureau. Please remember to always lock bicycles in appropriate locations (bike shelter, lockers, or racks) using personal bike locks. U-style locks as opposed to cables or chains are most secure and are recommended. The use of both the East and West A.F. Gray parking lots are for Warner Pacific employees and visitors only. Student vehicles are not permitted in these lots on weekdays from 8 a.m. to 5 p.m. The Schlatter and the Library lots are open to permitted Warner Pacific employees, students, and visitors. Warner Pacific apartment complexes (Saxon Apts., Division St. Apts., Tabor Terrace Apts.) are for apartment residents only. Apartment residents must display a current Warner Pacific parking permit and an apartment endorsement sticker for their complex. Stickers may be obtained free of charge in the Office of Student Affairs. For other questions regarding parking on campus read the Warner Pacific Parking Policy (pdf) or contact the Campus Safety Supervisor at 503.517.1219.